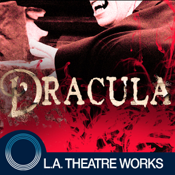 Dracula (by Bram Stoker) is presented by L.A. Theatre Works. This standalone audiobook app combines a professional audio recording with supplemental features for download-once, grab-and-go anywhere enjoyment. Famous for introducing the character of the vampire Count Dracula, the novel tells the story of Dracula’s attempt to relocate from Transylvania to England, and the battle between Dracula and a small group of men and women led by Professor Abraham Van Helsing. An L.A. Theatre Works full-cast performance featuring Denise Carole, Sheelagh Cullen, John Glover, Karl Miller, Lisa O’Hare, Moira Quirk, David Selby, Andre Sogliuzzo, Simon Templeman, Nick Toren and Matthew Wolf.